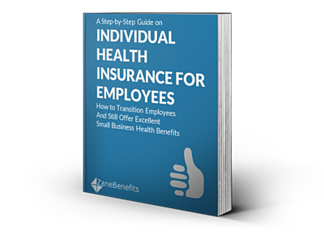 Zane Benefits, the leader in individual health insurance reimbursement for small businesses, announced today the publication of a new eBook, "A Step-by-Step Guide on Individual Health Insurance for Employees." The guide helps small businesses switch to individual health insurance and offer excellent health benefits at a controllable cost. According to Zane Benefits, small business owners want to provide the best health insurance to employees. And yet, traditional group health insurance has become too expensive. It no longer works for small businesses or employees. To offer better health benefits, small businesses nationwide are adopting individual health insurance for employees. As small businesses make the switch, many owners and HR administrators have questions about how to adopt individual health insurance and transition employees. The new eBook outlines four simple steps to transition employees to individual health insurance, all while offering excellent health benefits at an affordable price.